What can we expect from Samsung's mid-range smartphones? It seems that with every passing week we're getting ever more information about Samsung's upcoming Galaxy A series, with the latest set of leaks concerning the mid-range A5 and A3 handsets. 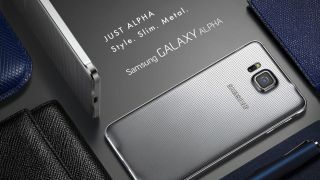 According photos posted on the AndroidMX twitter account, both the Galaxy A5 and A3 will sport the same aluminium unibody as Samsung's flagship handset the Galaxy Alpha. The Galaxy A5 will feature a 5-inch Super AMOLED screen, with a 13MP rear facing camera and a 5MP front facing lens. Beneath the unibody design will be a Snapdragon 400 processor, 16GB of internal storage and a 2330mAh battery. It's also expected to go on sale for around $400 to $450 (around £276, AU$511), which backs up rumours we've heard previously. Meanwhile, the Galaxy A3 looks like it may come with dual-SIM card slots and, as with the A5 and A7, is expected to come be LTE-ready. You can view all the photos on AndroidMX's Twitter account.